Vijay Chart House :- Even if you are a slightest fan of Kachori Samosa (Don’t kill us for this, every Indori sure is) then the name ‘Vijay Chaat House’ must sound as familiar to you, as your own blood. They have been taking care of ever craving needs of Indoris to satiate their food buds from the year 1969. And making sure that you get the right dose of the taste, this city is so very much famous for. Started by Shri Dayashankar Ji Thaker, Vijay Chaat House has come up a long way and has earned itself a remarkable reputation. The three places where it is; Chappan, Sarafa and now at Bhawarkua. Their new shop, which was inaugurated in the month of February, 2017, are the places you will find Indoris flocking to get their hands full with Yummy Kachoris, Tasty Samosas and Lip Smacking Patties that Vijay Chaat House almost has a patent on. Jatin Thaker, Mrudul Thaker and Kashyap Thaker are the young faces of Thaker family. Who have taken the command now and you can see them in their signature White Kurtas, making awesomely delicious preparations for you! The most famous items of Vijay Chaat House are no doubt the Patties, followed by Kachori and Samosa. No matter from where you going to eat them in Indore, if you have had them at Vijay Chaat House once; then you are definitely going to come back to the place asking for more! We have yet to see another place in Indore that serves Patties as awesome, as yummy, as fresh and as delicious, as Vijay Chaat house and this is the goodwill they have earned, and this is the taste they have maintained for years, which makes them stand out proudly! Another feather in the already shining cap of Vijay Chaat house is – ‘Das Bhai.’ It’s a new venture that is solely going to concentrate on online offering of all the items the house is famous for. For all the patties lovers across India, if you are someone from Indore, who has recently shifted his base to another city, then lo and behold! You have a reason to rejoice as they are soon going to offer frozen patties that can be ordered online and will be delivered right at your doorstep! The yummy taste of Vijay Chaat House of Indore, around India; this is what Das Bhai has on offer! Vijay Chaat House never compromises on quality and you can be sure that whatever you are eating from there, is 100% free from preservatives, artificial colours, and are made with 100% pure Ghee and Groundnut oil. 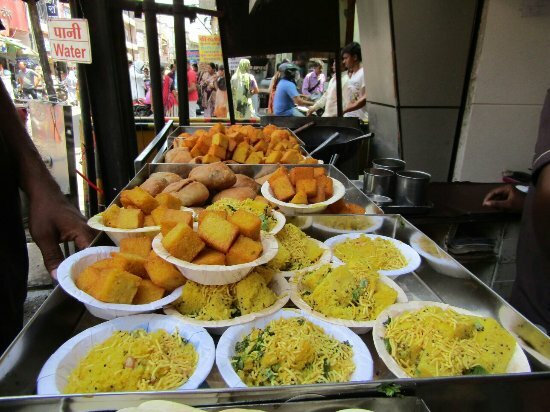 Vijay Chaat House has been immensely popular in Indore since decades for its Indian street food !! It serves Coconut Patties (Khopra Patties), Pea Patties (Matar/Batlaa Petis), Pea Kachori (Matar/Batla Kachori), Samosa, and Khaman (Surati, Amiri, Fried, etc.) !! These are not the regular baked patties that you may think them to be !! Rather, they are deep-fried balls of mashed potatoes stuffed with grated coconut in the centre !! When they turn a great Rust-Golden colour in the huge pan, they’re taken out and served with chutneys (sauces) – one is mint & coriander (‘pudina’ & ‘kothmir’) while the other one is a tangy-sweet sauce made of tamarind (‘imli) !! Vijay Chaat House also serves some Indian sweets/desserts ! !